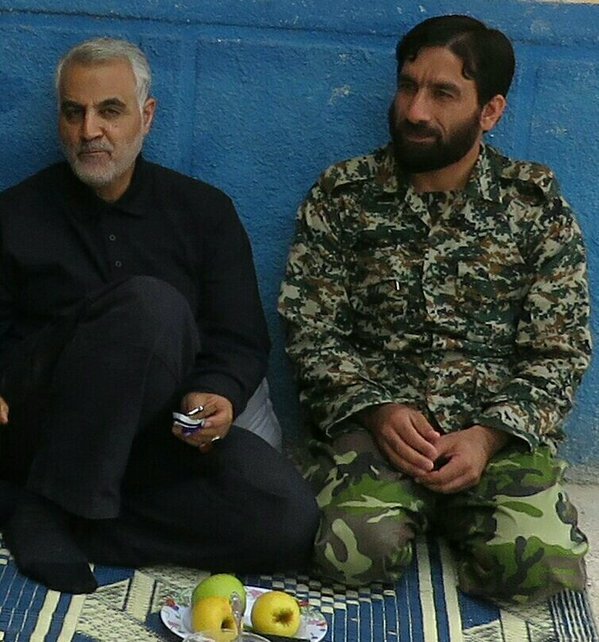 IRGC Colonel Ezatollah Soleimani and Captain Sajjad Hosseini were reported killed today killed in action in Syria. There has been a significant spike in the number of Iranian KIAs in Syria since 7 October, when Iran-led offensives near the city of Aleppo began. Today’s casualties bring the number of KIAs in Syria during the past three weeks to 34. 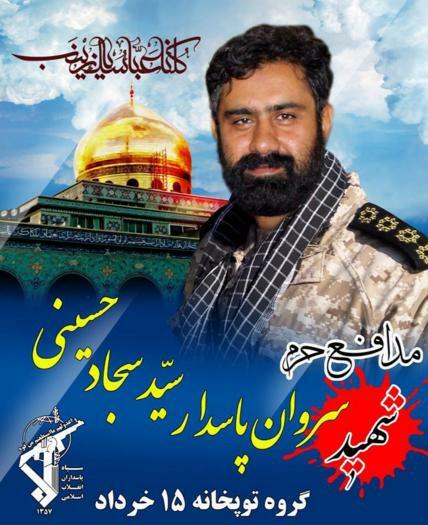 Bottom photo: Poster announcing the death of IRC Captain Sajjad Hosseini, of 15 Khordad Artillery Group, in what is described as the defense of Hazrat Zeinab holy shrine. As late as today, Iran said its military servicemen are deployed to Syria in an advisory role, denying their participation in combat ground operation. The high number of casualties, of all ranks and positions, makes the claim questionable. Iranian press, and social media, have been reporting on funeral ceremonies and memorial services of the KIAs in Syria regularly. It is OK for pasdars to fight in Syria but not in ones and twos, if the regime had committed 0.5 percent of the 20 million man army of Sepah the war in Syria would have been finished 3 years ago....It seems that Daesh and Al-Nusra front are hunting the Sepahis to reduce their morale. 1) no country in the world have 20 Mill Armee , not even China, has this. Iran has maximum 2 Mill Trained Armee, 0,5% of " millonens are only 10,000. 2) to be a Key Board Warrior is much easier to go to Syria. If Iran is not fighting the Takfiri in Syria, thy have to fight them in Iranian soil. Well there are two types of advisory assistance you can give and I think here once again the mistake is to see with Western glasses. When it comes to the traditional military adviser is someone expert or high ranking (normally a combination) which from an HQ or forward base gives advice and probably watch the battle very remotely. When it comes to IRGC, as it is a semi-traditional military force and semi militia force, advisory means to closely, with your own eyes, sense the battle terrain, formations, real fighting capability, morale, tactics and strategies on the both sides of the battle field in real-time. It also includes to understand the peripheral socioeconomic dynamics and relations of the fighting forces as in any guerrilla warfare that is determinant for your success. As Syrian army seems to have very poor intelligence of what is going on in the country, specially in areas where the dynamics are complex and quick, being on the front line to gather the intelligence in real-time, analyze it, craft tactics and strategies and lead bulk of the force based on that is indeed completely essential. As such IRGC advisers and experts must spend time in the font line which also will help to boost the morale of the Syrians. Besides that you are right that Daesh and Al-Nusra are particularly targeting the Iranians in order to reduce their morale but again this is must be due to poor information protection capability of Syrian army as obviously there is information and intelligence leakage in the ranks. Let's actually go by your definition of advisory assistance, seen through non-Western lenses. Why is it that in the past three weeks, IRGC has lost 34 advisers, including three generals, by far more KIAs than any other period in the 4.5 years of war in Syria? Are you saying prior to 7 October, when we had very few KIAs, Iranian advisers were watching the battle very remotely, like their Western counterparts, and since 7 October, they started to be close to fighting, or as you say seeing the battle with their own eyes? What's the reason for the drastic change in the advisory doctrine? Now looking at the issue through logical lenses: Shouldn't we assume that the IRGC has not changed its doctrine, and short of pure bad luck, the reason for the huge spike in the number of KIAs is that their servicemen are now involved in actual combat? BTW, if the IRGC confirms its new involvement in combat operation, do you think they made a mistake changing their strategy? Or would you find a new explanation through non-Western lenses? Iranian military is quite hopeless to be honest, they are under armed. have obsolete equipment and very poorly trained by modern standards. Iran is in the weakest state it is in, should have stayed clear of the Arab mess, but unfortunately the Akhoonds are more Arab than the Arabs. Iran has no airforce, navy or army to speak off. Even UAE can knock off Iran at anytime with its F-16 fighters. Iranian "diplomacy" is another total failure as Russians have played games with Iran and not even delivered an AK-47, let alone S-300 or SU-30. Iran today has a weaker military than Afghanistan. The war in Syria is all about US/Zionist strategic agenda and destruction of any Arab or Muslim nation that challenges the status quo and ISIS did not come out of thin air. Iranians have suffered over 400 dead now and failed at every effort and ISIS has gained considerable ground around Homs since Russia started a lukewarm and hopelessly limited air campaign. The US, Saudis, Jordanians and Turks have injected over 150,000 terrorists in Syria and Iraq since 2011 and the recruitment in madrassas is growing, while Syrian and Iraqi military manpower pool is dwindling and most men are voting with their feet and heading to Europe. Russia after its airliner loss has to make a choice either escalate or go home. US would prefer to bleed Russia in Syria. It. You are also exaggerating the IRGC casualties this is not fair to the Good Men of the IRGC and Hezbollah. Hezbollah is hunting down all the Terrorists Leaders. Aleppo will be liberated soon. Yes...and planet Mars can soon be taken by ISIS and they are so great...no my friend, try to get back on the ground from the sky and once you analyze you see reality on ground is not that easy. Iran might be poorly armed, its soldiers killed, Akhoonds being Arabs etc. but no one has dared attacking Iran since the idiot Saddam Hussein who was hanged by the American supported forces. So will you see the bloodshed end amongst the proxies? no you will not...unless the big powers decide it or the proxy peoples realize this is just a game to get their countries and populations destroyed. What do you mean that we are "exaggerating" the extend of casualties? We are reporting the names, and ranks if given, based on reports in Iranian media, and the funeral and memorial service announcement. The 34 KIS in the past three weeks is a fact. I don't understand your objection that the reporting the true number of casualties is not fair to the IRGC servicemen. Unless I am reading your comments wrong, which I appreciate if you would correct me. See Mr. Uskowi, that is the problem with our region and people as no one wants to accept facts and that is why they are so easy to manipulate by foreign forces. "Even UAE can knock off Iran at anytime with its F-16 fighters"
Here I agree with Nader...there is no exaggeration....he is even publishing the pictures of the KIA from Iranian media...so there is nothing added than pure news published in Iran itself. Iran also has Smerch MRL type of missiles besides Fateh 110 and Persian Gulf missile with smart ammunition which have a range of up to 90 km. These are placed amongst others on Abu Musa island which can be used in case of any threat.